The state of Kansas compensates the nursing assistants with lucrative salaries. As per the statistics of indeed.com, the average salary of a CNA was $22,000 per annum, as of December 2014, which was 9% lower than the average pay of CNA for job postings at the national level. In May 2013, the annual and hourly mean wage in the state was $23,110 and $11.11, according to the Bureau of Labor Statistics. In the same year, state employed 19,310 nurse aides. Employment per thousand jobs was calculated to be around 14.45. 90% of certified nurse aides were waged less than $29,450; 10% made more than $29,450. 75% of CNAs were paid less than $25,550; the remaining 25% received more than $25,550. 50% of the employees earned less than $22,540; the rest 50% earned more than $22,540. 25% of certified nursing assistants were offered annual wages less than $20,350; 75% were paid more than $20,350. 10% of employees were offered less than $18,160; 90% made more than $18,160. There are many variations in the salary figures of a nursing assistant within the state of Kansas. 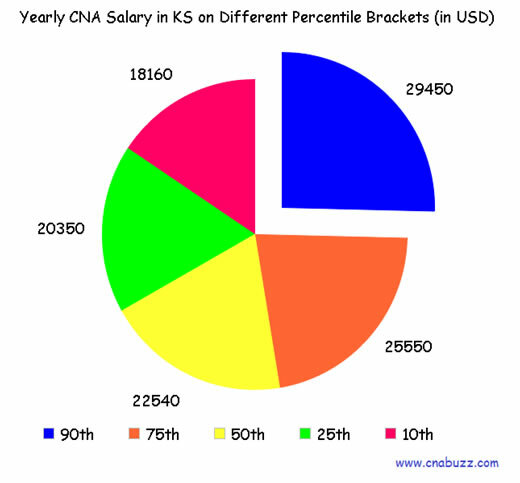 According to the salary.com, the maximum median annual salary enjoyed by a CNA was $30,213, which was offered by a number of cities including Kansas City, Lenexa, Olathe, Overland Park and Shawnee. Salina offered the lowest median annual salary ($25,961). The median weekly salary in the state varied between $499 and $581 and the median hourly salary ranged from $12 to $15. Nursing assistants have a number of choices to upgrade their position in the nursing industry. The salary of a CNA largely depends on the designation. As indicated in the table below, CNA Hospice enjoyed an income of $29,000 in December 2014. The least paid workers were Correctional Prison Facility CNA with annual salary $14,000. The salaries of other designation ranged between $15,000 and $27,000. According to BLS reports, CNA is listed as a profession that is predicted to expand at a faster rate. The requirement of nursing assistants is likely to increase, especially in the nursing homes. Additionally, numerous chronic conditions also enhance the demand for patient care. Question 1 – I will be obtaining my CNA at the end of this summer, can anyone suggest me from where can I start working? Answer – After completing the 1st semester of nursing school, all CNAs can start working in the hospital and can earn up to $11.11/hr. Question 2 – Presently, I am working in Salina, KA and planning to move to Lenexa city due to some personal reasons. How much hourly pay can I expect in the city? Answer – In Lenexa, an hourly pay of $15 is offered to the nursing assistants, which is the maximum among all other cities in the state.